Angiopoietin-1 antibody LS-C696961 is a Cy3-conjugated rabbit polyclonal antibody to dog Angiopoietin-1 (ANGPT1). Validated for WB. 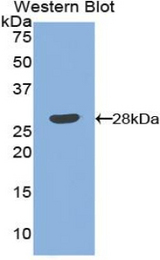 Recombinant ANGPT1 (Thr266-Phe497) expressed in E. coli.